The Seafront Officers start at 6am each morning, including Christmas Day carrying out a full inspection of the promenade and beach to check everything is as it should be for a busy day ahead. 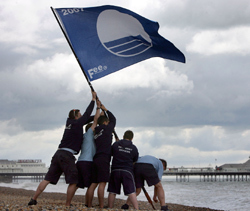 The seafront area we cover is from Hove Lagoon through to Saltdean Undercliff. We operate a first aid post all year round and lifeguard service from May through to September each year. The office is open to the public to seek information in and around the seafront as well as safety advice, lost property and how to book seafront facilities such as the volleyball court. We also run a lost child centre and work closely with the local police on tackling anti-social behaviour. The Seafront Officers are trained beach lifeguards and each quad bike is equipped with an AED (automated external defibrillator), oxygen and a first aid kit to respond to incidents. The seafront also assists with the events which take place and also the council owned properties. We are open to the public from 9.30am through till 5.30pm low season and 8.30am to 7.30pm in the summer months. If you have any questions relating to all aspects of the seafront or need help and advice then please call us or pop in to see us as we are always happy to help. In the event of an emergency please dial 999, we have direct links with Solent Coastguard, Brighton RNLI and all emergency services and we can respond on their call.